Discover the marvels of the southwest of Sardinia, an incredible world if its own, and one refreshingly new to the senses yet filled with ancient wonders. Travel through an easy route in a trip that is suitable for everyone, including families and children. This adventure will let you know the history, traditions, architecture, and beaches of this part of Sardinia where there are rocky promontories, secluded coves, and island coasts with a backdrop of emerald green and the electric blue of the sea with its clear waters. During this cycling holiday, you will be staying in three or four-star hotels. Double rooms will be arranged for you. Night one will be spent in Iglesias. Enjoy your stay in Capo Pecora on night two. Doze off in Portoscuso on night three. Get comfortable in Calasetta on nights four, five, and six. Have a well-earned rest in Cagliari on night seven. You will arrive in Cagliari and meet with the Ichnusabike staff. You will then be transferred to Iglesias. Upon arrival at the hotel, you will settle in your accommodations and the team will deliver their booklet and briefing for the tour. You will have free time to rest or visit the natural and mineralogical sites of the town. On day two, you will travel towards the sea, from Iglesias to the wild landscapes of Capo Pecora, through the mining village of Fluminimaggiore. During the trip, you could visit some interesting sites such as the ancient Punic-Roman temple of Antas which is dedicated to the Sardinian people's eponymous god, Sardus Pater Babai, and the natural caves of Su Mannau with its six kilometers of broad halls, galleries, and wells. After breakfast, you may experience the most difficult lap of your journey! After crossing the mining village of Bugerrru, you will start a series of difficult, but not impossible uphills and downhills, that will take you to Nebida where the descent to the coast will start. During the trip, you will be suggested to stop at the creek of Cala Domestica with its beach covered in fine sand. In the evening, you will arrive at the hotel near Portoscuso. After breakfast, you will take a boat to Carloforte, a seaside town whose architecture, dialect, and traditions recall the origins of its Ligurian inhabitants. Once you have landed on the island, you will go on an excursion which will enable you to visit the Island of San Pietro among ponds, natural monuments, and scenic beaches. In the evening, you will take the boat to Calasetta. Once you have left your hotel near the sea, you will set out on an interesting tour of the Island of Sant'Antioco with its museums, traces of the past, and landscapes that make it unique in the world. You will journey from Calasetta to Sant'Anna Arresi, deep in the south of the island. Along the way, you will visit the Church of Santa Maria and the abandoned medieval village of Tratalias, which is currently being restored. Shortly before reaching the hotel, following the road-book, you will reach Porto Pino, a little sea location renowned for its dunes and beaches of fine white sand. You will travel from Sant'Anna Arresi to Chia along the southern coast and there, you will admire a beautiful mixture of wild coasts, Mediterranean scrub, and lovely creeks. Once you reach Chia, all you have to do is relax and sunbathe on the beautiful long beach and wait for the transfer in the afternoon that will bring you to Cagliari for the last night of the tour. The team’s services will end after breakfast. You will be bid farewell for your departure or you can acquire a transfer upon request. You may extend your stay to enjoy a few days of relaxation by the sea. Each bike is provided with a one-sided rear bag of 20 liters plus one small bag with a spare tube, repair kit, air pump, lock, and helmet. Ichnusa Bike Adventures provides 1 GPS for each couple or room where they already charged an updated track list with one track for each day. This cycling holiday will take place in Iglesias, Capo Pecora, Portoscuso, Pan di Zucchero, Carloforte, San Pietro Island, the Island of Sant'Antioco, Sulcis region, Sant'Anna Arresi, Tratalias, Porto Pino, Chia, and Cagliari in Sardinia, Italy. During this cycling holiday, you will be provided with four mouthwatering dinners. 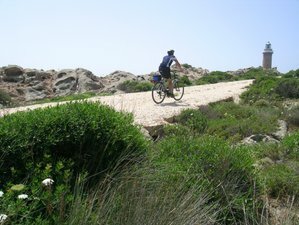 Ichnusa Bike Adventures specializes in active walking, cycling, and kayaking holidays in Sardinia, Italy. Third persons for triple rooms are eligible for a special discount of 10%. Single room supplements can be availed at 150 EUR. Bike rentals are priced at 80 EUR plus 10 EUR for each additional day while e-bike rentals are priced at 190 EUR. You can purchase an extra GPS for 50 EUR as well as SPD pedals for 10 EUR. A private bike guide can be hired for 1,850 EUR, with up to eight or 10 people maximum.